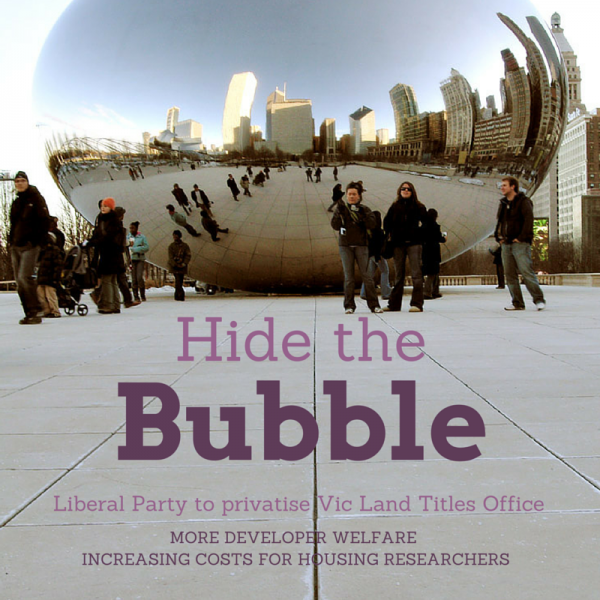 “The Napthine government policy announcement it will sell Victoria’s Land Titles Office if re-elected is a grave error and to be condemned,” David Collyer Policy Director Prosper Australia said today. “The Land Titles Office is a core government function, as fundamental as the judiciary and Parliament itself. “It makes legal decisions regarding land rights on every property transaction in Victoria. The government guarantees the integrity of the register with unlimited liability. This cannot be the case if the register is sold to the highest bidder and privately provided. “Land ownership in Australia is a legally enforcable contract between individuals and government – usually described as The Crown to emphasise its ultimate sovereignty. Landowners commit to use the land, to pay taxes due and submit to the authority of the elected government. Government undertakes to protect their private interest with a strong and widely understood body of law, and with force if necessary – the police against local abuses and Australia’s defence force against foreign threats. The Land Titles Office documents this agreement. The UK recently used its poor tax system as an excuse to attempt a similar selloff. UK land valuers obliged the conservative government to withdraw the idea, pointing out it would allow a private entity to adjudicate on the conflicting interests of sellers, buyers, lenders and neighbors. ”Corporate control of Victoria’s land registry will also cloud the key economic statistics that guide good government. This essential data source is highly attractive to data providers who can then charge fees to the many users. “Prosper Australia has been analysing land data for a century and we have seen a marked increase in data costs. In the 1970’s, title searches were free. Now they cost $4 each. When thousands of properties have to be accessed, cost makes research prohibitive. Prosper paid $6,000 for 12 key lines of an excel spreadsheet from a private operator last year. In the past this data was free. ”The digital age has brought access to matters on the public record within reach of us all. Privatising this data can only make deciphering Australia’s record land bubble harder. This will suit the myriad Liberal Party benefactors in the property development game. ”A government with vision would be installing a fairer, more efficient tax system, not relying on privatisations. Reforming conveyancing Stamp Duty to State Land Tax is the sort of leadership the locked out generations deserve,” Collyer concluded. Former Prime Minister Keating once mentioned Australia was in danger from becoming a ‘Banana Republic’ due to a lack of economic measures for long term real growth. What he failed to mention was the main culprit is the entire political institution of this country. This corrupt institution has no direction, ideals, priorities and definitely no vision for anything economically sensible for the future of this nation. It exists only to promote the interests of those who pay for their election campaigns while keeping us all divided and fighting among ourselves with issues that politicians do not believe in. This is probably the only thing they do right.